As you read this, I am, hopefully, high up somewhere over the Atlantic trying to get a 9-months-old to nap in a cot and entertaining an almost 5-years-old with nothing more than a book, a pen and a paper (and in-flight entertainment hopefully). We are embarking on a little road trip for the next 3 weeks. As you may know, P travels a lot for work. He has been in Washington, D.C. for over a week now and this time, we decided to join him! It had been too long since our latest big adventure (in Brazil), when LJ was 2. We needed to discover another part of the world we do not know. We wanted to play it safe with a baby but go far enough for a little of winter sunshine. We land in Washington where we will spend 4 days getting over jet-lag and exploring the city P has been raving about for a couple of years now. LJ has already put on her list a number of museums (dinosaurs in particular) she saw pictures of on her dad's phone. We will then fly down to New Orleans for 5 days in a city I have always dreamt of in the USA. We will be filling out tummies with beignets gumbo, crawfish, jambalaya.... and listening to some weird Cajun creole while pronouncing French names with a strange accent. Oh, I can't wait! The road trip part really starts when we head out of NOLA and make our way to Florida. 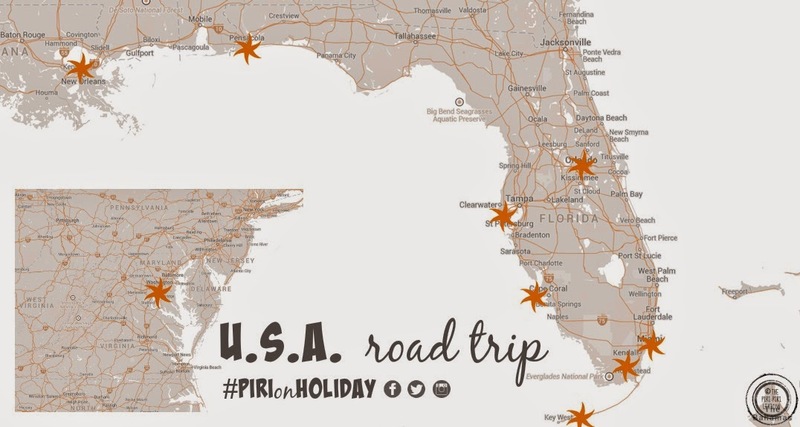 We have planned our stopovers in Pensacola, St Petersburg, Sanibel Island, The Keys and the Everglades spending two or three days in each place. We plan to take long strolls on beautiful beaches while looking for sea shells. We hope to spot manatees, dolphins, alligators (and mermaids, hum...) with our packed binoculars and snorkel. Miami Beach will mark the beginning of the end of our road trip. Art deco buildings, empanadas, sand castles should make for a great 3 days in this culturally exciting city. Finally, yes! We caved in! We will be stopping over at Disney World for 3 days. Once in a lifetime opportunity and all that. Need I say more? We hope you will follow us on our adventures and travel (if only virtually) with us. Now, bare a thought with me as I am alone (if you don't count the other 200 passengers) for 9 hours in a confined space with two charming, calm and sleepy kids (NOT).